All my fine arts and philosophy student friends claim discrete logarithms are hard. Prove them wrong. 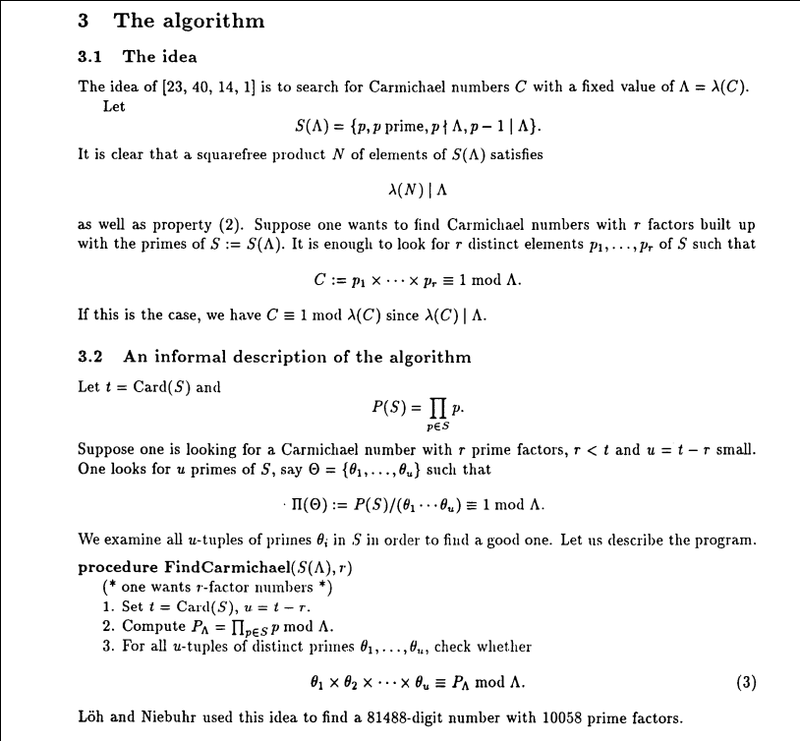 Summary: bypassing Fermat primality test with Carmichael numbers and solving discrete logarithm using Pohlig-Hellman algorithm. We need to supply a large prime modulo $q$ with large multiplicative subgroup of order $p$. And then the server will ask us to perform a discrete logarithm in this group. There are no known algorithms for such setting. However, here we can bypass some conditions – the primality test. 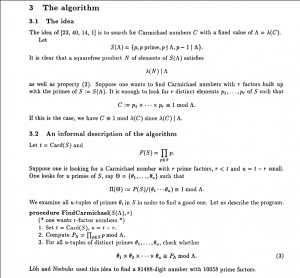 is_prime uses Fermat test to check for primality. It is well known that Carmichael numbers bypass such test easily. Note that Carmichael numbers do not bypass Fermat test in 100% of cases! They bypass if only when witness (base) is coprime with $p$, otherwise the base yields a divisor of $p$. Nonetheless, for non-Carmichael and non-prime numbers Fermat test declines composite numbers with much higher probability, therefore Carmichael numbers are our only hope here. Generate Carmichael $q$ (false prime) until we can find a large real prime factor $p$ of $q-1$. In such case we will be able to do discrete log modulo each prime factor of $q$ and then combine them using CRT. Generate Carmichael $p$ (false prime) until we can find a large real prime $q$ for which $p | (q – 1)$. In this case we will have to do discrete log modulo large prime $q$, but separately for each of the small subgroups (obtained from factorization of $p$). For both ways we would need Pohlig-Hellman method, but in the second case the arithmetic will be much heavier (since all small logs must be done modulo large $q$). Also it is easier to find small prime $p$ than large prime $q$. Therefore, the first way is preferrable. The way we will find $p$ is simple: first we obtain some Carmichael number $q$, then we remove small factors from $q$ by let’s say trial division. Then we check if the result is prime. It should happen quite often! print "q =", q, "#", len(q.bits()), "bits"
print "p =", p, "#", len(p.bits()), "bits"
q = 409 * 421 * 443 * 463 * 521 * 613 * 617 * 631 * 661 * 673 * 859 * 881 * 911 * 937 * 953 * 991 * 1021 * 1123 * 1171 * 1249 * 1321 * 1327 * 1361 * 1429 * 1531 * 1871 * 1873 * 2003 * 2081 * 2143 * 2311 * 2381 * 2731 * 2857 * 2861 * 3061 * 3169 * 3361 * 3433 * 3571 * 3697 * 4421 * 4621 * 5237 * 5281 * 6007 * 6121 * 6553 * 6733 * 7481 * 8009 * 8191 * 8581 * 8737 * 9241 * 9283 * 10711 * 12377 * 13729 * 14281 * 16831 * 17137 * 17681 * 18481 * 19891 * 20021 * 20593 * 21841 * 23563 * 24481 * 25741 * 26209 * 27847 * 29173 * 29921 * 30941 * 34273 * 36037 * 42841 * 43759 * 46411 * 48049 * 52361 * 53857 * 55441 * 63649 * 65521 * 72073 * 72931 * 74257 * 78541 * 79561 * 87517 * 92821 * 96097 * 97241 * 110881 * 116689 * 117811 * 131041 * 145861 * 148513 * 157081 * 180181 * 185641 * 209441 * 235621 * 269281 * 291721 * 314161 * 371281 * 388961 * 445537 * 471241 * 680681 * 700129 * 816817 * 1633633 * 8168161. After finding good $p$ and $q$, it is easy to solve the rest of the problem. First, since we can’t bypass the test in 100% of the times, we have to do a few iterations. Then, if the tests pass, we need to solve the discrete logarithm problem. Luckily, Sage automatically factors the modulus (and all the group orders) and applies Pohlig-Hellman method. Since the factors are small, we don’t need to supply our factorization to Sage, it finds it quickly automatically. We only have to ask Sage to compute $discrete\_log(v, g)$! print "Primes are accepted! Getting discrete log"